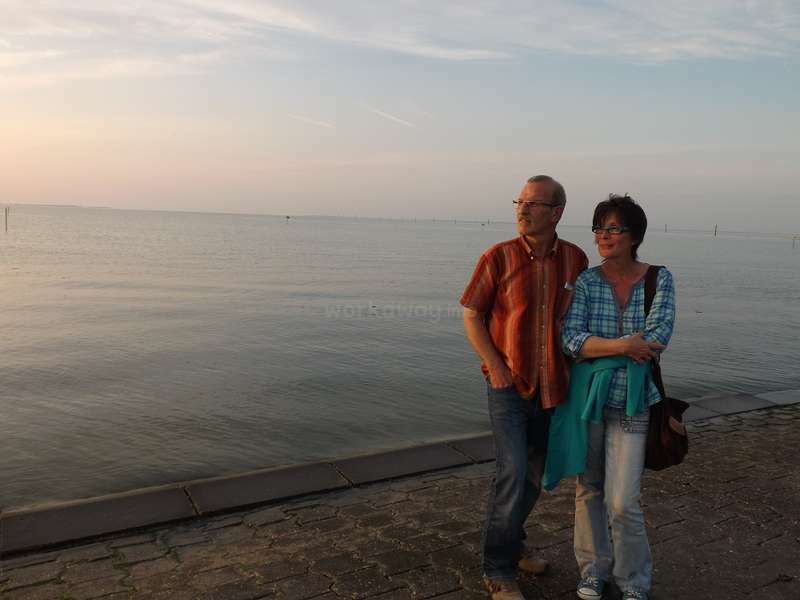 We, Thomas and Heike, are a couple that moved to the North Sea to live our dream. We live on a farm near Carolinensiel,only 700 meters away from the sea. We are friendly, humorous, communicative and very interested in other cultures :-). Before you continue reading please notice two absolute neccessities to be with us: you have to have some basics in the German language. It is not neccessary to speak fluent, but for the communication with our holiday-guests, our friends, visitors and us you have to understand and speak some German. The second aspect is that we have only place and work for one person. Please respect these two conditions and don`t contact us if you don`t understand and speak some German and if you are looking for two persons!! Thank you! We own 8 Llamas, 3 Alpacas, 3 goats, 2 ponys, cats and dogs. We rent holiday apartements at our farm and our holiday guests are always people who love animals and nature. We also conduct pedagocical and therapeutical work with our animals, especially for people with mental and physical disorders. In the winter months, some work in the house and in the holiday- apartments are to do: Replace flooring, wallpaper walls and painting walls. If you have skills in these areas and if you like the North Sea in the stormy winter: send us a message :-). You will have your own room and we will give you 3 meals a day (Breakfast, fruits, bread or something like this for lunch and warm dinner). You can use our bicycles if you want to make trips around the countryside! This can be an awesome place for you to spend some time, you will discover how typical pet owner live, you will feel like you are on Holidays, because of the great location directly to the sea. It doesn`t matter if you are a smoker, but there is only one room in the house in which it is allowed to smoke ;-)! Our workaways have a direct connection to us. We live together under one roof, work and cook together and have our meals together. We take them with us to our friends if they want and they can come with us if we make a trip. Important for us is the communication, we like to talk about the way of life in different countries and cultures. Our workaways by themselves learn here a lot about German culture and historie, about respect and care for animals and about the possibilities for a happy, harmonic and good livestyle. And of course they learn how to spend time away from big cities :-). 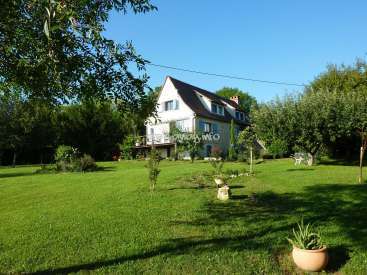 - the maintenance and repair of the barn and the farmhouse. You will have your own room and access to a bathroom. Your room is smokeless. We are looking for volunteers to help with the animals, in the house and with tourists. From November to February we also need help for renovating the house, for help in the stable and in the household. I stayed with Heike and Thomas for a month as my second workaway and really enjoyed the experience at their animal farm. The daily tasks involved looking after the animals plus anything that was needed at the time, such as cleaning the car or cutting the grass. There was plenty of time to go to the beach (when the weather was decent) and to… read more explore the surrounding area (which is both beautiful and relaxing). Heike is a very talented cook so it nice to try various German dishes (everything was always delicious). Heike and Thomas both really tried to help me improve my German skills too. Overall, it is an interesting project to be a part of so you will not regret messaging them. Thank you! Marcelo has spent a month with us and our animals. It was really very nice to have him here. He helped in the stable every day and he was always very friendly with our animals and ....of course....with us, too. We took him with us to our friends and our weekly pool- evening and that was always very nice and funny. Heike and Thomas are not only some of the most welcoming and nicest people I’ve met, but also incredibly warm-hearted, kind and helpful. I really loved staying with them, they really take you in as part of their family. As my first time as a workawayer, I couldn’t find a better place, as I was really looking forward to having a change of… read more lifestyle, disconnecting a little from the city. The landscape is beautiful, lots of nature, fresh air and skies full of stars, perfect for reflection and mental relaxation. This experience is full of learning: from the love they have for what they do, from their work, their interest in the wellbeing of the rest, their love and knowledge of animals, their family and friends, their culture, food (both excellent cook and superb bakers) and language. Helpwise, the daily routine is mainly helping in the barn, always good music thanks to Thomas’ choice radio, getting the place ready for the animals, feeding them and giving them water. If there are guests, you can also help cleaning and preparing the guesthouses. If you’re looking for something to do, there is always something you can help in. Heike and Thomas are passionate about what they do and how they do it, and they will really help you into being part of the family, and I will always remember them for this and for the Friday night specials playing billiards (ich muss noch viel lernen…). Special thanks to Ronja and Hanna, wonderful dogs always taking care of you. Vielen Dank für Alles, es war eigentlich ein sehr gutes Erlebnis mit Euch allen. Ich werde versuchen, Euch später während meiner Reise zu besuchen. Ein riesiger Gruss an alle, Familie, Freunde und, natürlich, Tiere!!! Jalisia spent four weeks with us and this time passed very quickly. Jalisia helped us in the stable, in the householdand with our holiday apartements. She was always very friendly with us, our animals and our friends and it was very enjoyable to have her in our house. I stayed with Heike and Thomas for 4 weeks. It was a great experience! A learned a lot about the German culture. In the mornings I would help Thomas care for the animals, and bond over rock music. Every evening we would all have dinner together. Heike would make traditional German food, and would take the time to show me how to make it. They… read more live in a beautiful area that is quiet and enjoyable. You are only moments from the North Sea, and there are lots of little cafes near by. I would recommend staying with Thomas and Heike if you are passionate about animals, and would like to learn more. Camilla stayed with us in September and it was a really nice time! She was always friendly and very polite! She took care for our animals and her main job was dogsitting, because we had got a new dog from an animal shelter in spain, which needed all our love and help during the first weeks in it`s new home. We thank Camilla al lot for everything she has done for us and wish her the best! 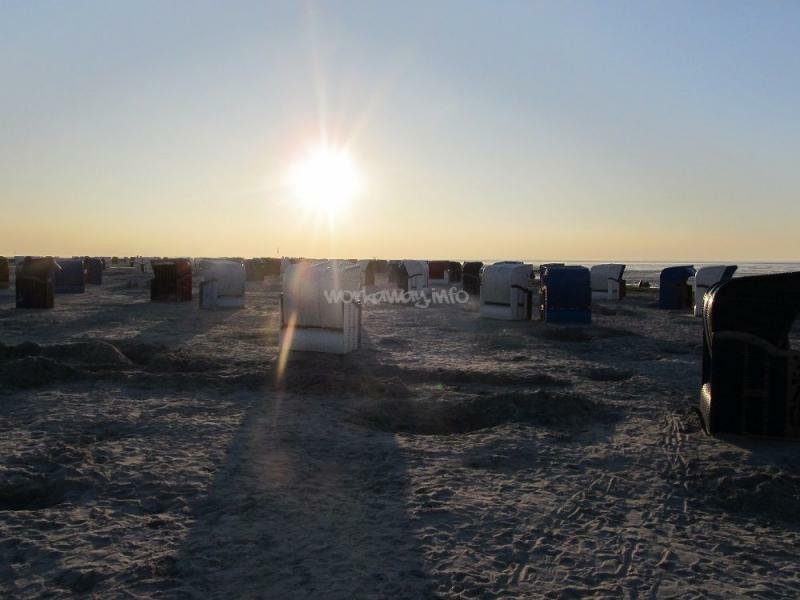 I stayed with Heike and Thomas for the month of September and I loved it! The atmosphere is super relaxing and all the animals, lamas, alpacas, the little goats, the ponies, Ronja and Hanna made my experience unforgettable. My job consisted in helping Thomas feed the goats and make a comfortable loo and bed for the lamas and alpacas both every… read more morning and evening. In the evening we'd go for a walk with the dogs, and it was relaxing and nice to see the dogs so happy. I found out I really like German food too, I especially loved Bratkartoffeln mit Heringstipp, Gulasch, Frikadellen, Currywurst mit Pommes and, of course, Thomas' special Nutellakuchen and Apfelkuchen, that were absolutely delicious! This experience helped me improve my German skills too, even if I still have lots to learn. When the weather was sunny, I loved to bike to Carolinensiel and have an ice cream there while looking at the small harbor. In conclusion, I really loved my time at Heike and Thomas' farm, and the only thing I can say now is :Thank you! My first workaway experience was at Thomas & Heike's farm. This experience was certainly a positive one. I've learned several things, not only about their lifestyles and work habits, but also about myself. Both of them are quite proud of German culture and traditions which allows you to really learn from their perspectives. Additionally, they… read more express an interest in learning from others' culture and manners as well which permits interesting exchanges. I will remember the unconditional love they share with their animals, their amazingly welcoming friends, and their honesty towards everyone. Thank you again for having me and for sharing your daily life with me. Jiyoung has spent three weeks with us. She was always friendly and she took care for the animals very well. Danke Thomas und Heike für die wunderschöne Zeit und alles Gute für Euch! Leah has spent three weeks with us to help us with our animals, around the farm and in the household. She was always friendly, diligent and ready to learn new things. Her main work was the supply of our animals by helping in the stable. Leah was always in time and she did her work reliable and accurate. She was never unfriendly with our animals,… read more our friends in the neighborhood and with us. Overall I really enjoyed my first workaway experience and appreciate that I got to stay there. All the best! Stephanie hat einen Monat hier mit uns verbracht, um ihre Deutschkenntnisse zu trainieren und uns bei unserer Arbeit mit den Tieren und im Haushalt zu unterstützen. Stephanie war immer freundlich und hilfsbereit, hat das Wesen unserer verschiedenen Tiere sehr schnell verstanden und sich äußerst liebevoll um sie gekümmert! Wenn Stephanie Euch fragt ob sie als workaway bei Euch sein kann sagt unbedingt JA! Das wird niemand bereuen :-)! Es war meine erste Work-Away Erfahrung und ich habe bei Heike und Thomas eine tolle Zeit verbracht! Ich fühlte mich wie ein Mitglied der Familie seit dem ersten Tag. Sie haben mir immer vorsgeschlagen, an ihren Freizeiten teilzunhemen und haben mich ihre Freunde vorgestellt. Die Arbeit auf dem Lamahof war sehr angenehm und ich habe entdecken… read more können, wie Heike und Thomas sich um ihre Tiere kümmern und wie sie sie lieben. Während einem Monat habe ich die Tiere gefüttert und die Ställe sauber gemacht. Ich habe viele Sachen über die Tiere auf dem Hog gelernt. Die Diskussionen mit Heike und Thomas waren immer voll spannend und interessant! Das hat mit auch sehr geholfen, meine Deutschsprache zu verbessern. Natalie has spent three weeks with us and it was a nice time with her! She is very friendly and polite to everyone and she loved our animals very much. She always took a very good care for them and after a short while she was able to do all the work in the stable. It was so nice to see how Thomas and Heike care for their animals and how they interact with them. I really esteem their work, they are doing a great job! Thanks a lot for hosting me, I learned a lot! Tevai spent 2,5 months with us and it was a really wonderful and harmonic time. Tevai loved all our animals and took care for them very responsible and friendly. She managed every work in the household and stable and she was a great support around the whole farm. We learned a lot about Tahiti and the tahitian culture and we liked it very much to… read more explain her a lot about Germany. Tevai offered her help whenever she saw some work to do - always in good mood and with a smile in her face. She went with us to some typical events in the county and all our neighbours and friends liked her very much,too. Thank you Tevai for your help and the nice time with you! Come back whenever you want :-)! I have spent a nice time with them. Caleb was always very polite and friendly and it was absolutely pleasant to share our house and home life with him! Whenever Caleb should ask you if you can host him - say YES!! You will not regret ist :-) !! Thanks a lot for beeing with us! Thomas and Heike are not only welcoming, but a happy, pleasant couple, who do great work with the mentally disabled. It was a pleasure and joy to stay at theirs, to work in the stable with Thomas, learn some German, meet their family, and experience simple living by the sea. The only thing I regret is not being able to spend more time with them. I… read more would gladly stay for two months more. Thomas and Heike are organized, helpful, easygoing, and patient (despite my lack of German ability). Their lovely ranch is about a kilometer, at most from the sea, and there are many things to do if you're willing to cycle. 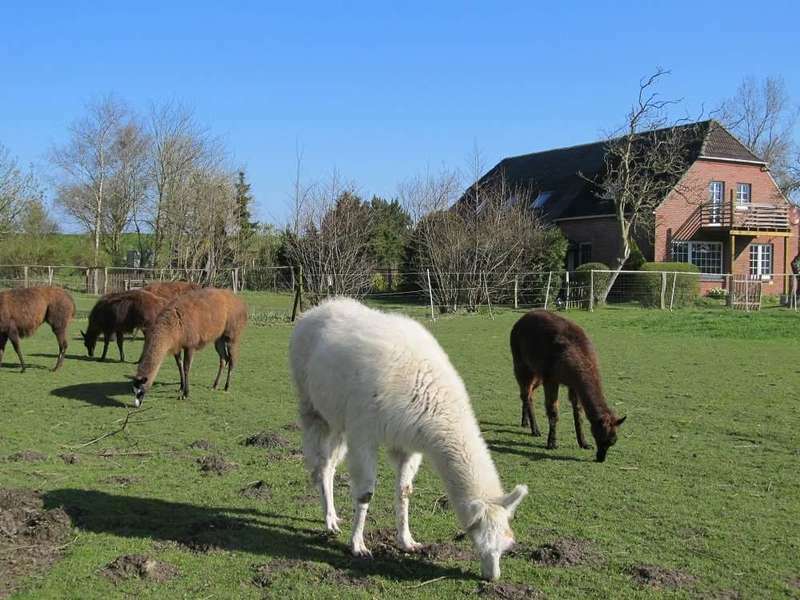 In short, I found my time at Llamahof, with the alpacas and llamas (and Ronja and Fredo, of course) to be refreshing and rewarding. Natalia has spent three weeks with us and it was a very peaceful and relaxing time! She came with the message " my German is not so good" ....but this was not true :-). She spoke German the whole time, tried to find the right words always and got better and better in speaking German. Big compliment! We learned a lot about Poland and the way of… read more living in Warsaw and the polish villages and the typical polish food. Natalia made some delicious polish food for us, for example Sernik and Pierogi. She was very uncomplicated and modest with her vegetarian diet and we always had to offer her to eat more :-). It was nice to sit in the garden with her in the evenings, to drink a glas of wine and to talk with her about " God and the World". 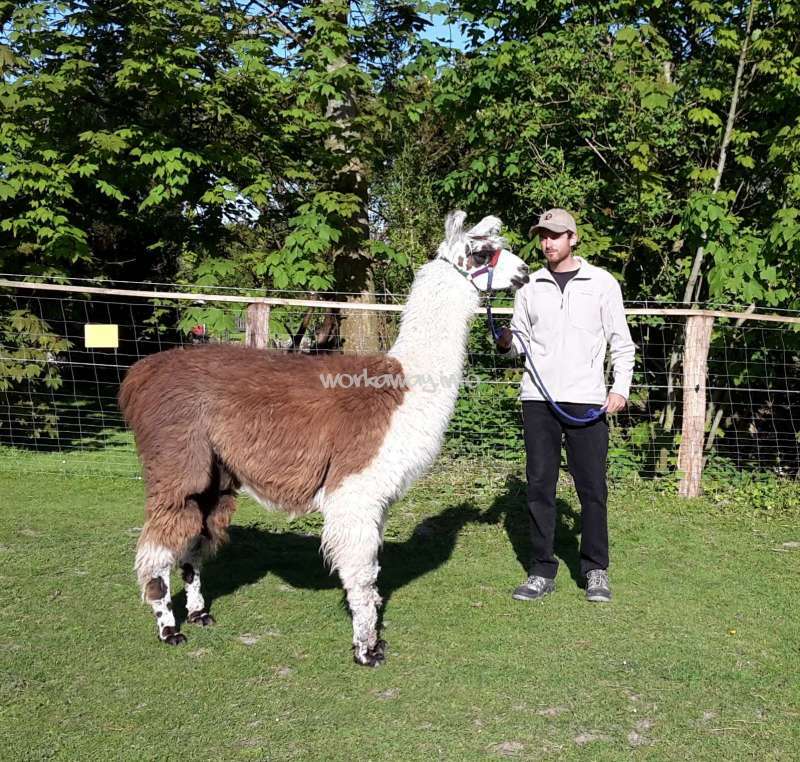 We had some nice walks with her and our alpacas and she became a good "llamero". I was lucky to spend 3 weeks with Heike and Thomas. It was my first workaway experience and I think I couldn't be luckier. From the beginning i felt very welcome. The atmosphere was always relaxed and warm. They made me feel like a part of a family. Every day i woke up in a cosy bed having the most cuddly cat – Blacky next to me (or on my head… read more ;) ). Then I was helping in stable having opportunity to learn a bit about lamas, alpacas, ponies and goats. I've never actually felt, like I'm working, because getting to know every animal was a pure pleasure (even rebellious El Nino :)) . We spent a lot of time together preparing meals and talking, so I could improve my German and learn a lot about German culture. Heike and Thomas were really patient with my vegetarian diet as well, making my Bauchlein voll (thank you for the curry wurst and veggie steak!). During my stay I didn't experience any boredom – we made some trips together to the nearby villages and have some delicious ice cream. I could as well use their bike and get around on my own. I feel grateful for every minute spent with Heike and Thomas. Thank You for your help, support and wish you all the best! Mauricio has spent two weeks with us and it really was a nice time with him. Mauricio was always friendly and polite an very interested in all things about the farm and the animals. There are a lot of fences at our farm and Mauricio has painted them all very patient and ordinary :-). I stayed with Thomas and Heike for two weeks and really enjoyed my stay with them. They are truly attentive and gracious hosts, and they are always looking for ways to make your stay more enjoyable. The work I had to do was pretty relaxed and what I consider fair. You get plenty of time to explore the area and they also had a bike for me to use!… read more :). I would recommend this 'workaway' opportunity to anyone who enjoys working with animals and enjoys spending time on the countryside. If you do, you won't regret going to Thomas and Heike's property! 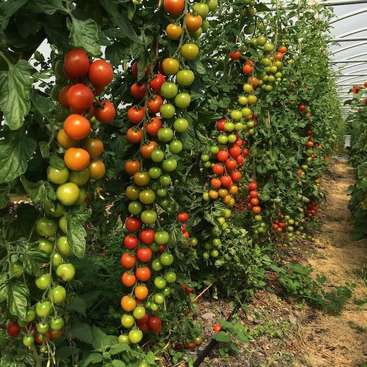 Haruka has spent three weeks with us at our farm and it was our first experience with a student from Japan. It was really nice to have Haruka here and to get a lot of knowledge about the Japanese culture, te way of life in their families and to taste the Japanese cuisine! We learned how to eat with chopsticks .....not perfect but practicable :-).… read more Tempura was great! Haruka is an absolutely friendly and polite woman. She was always really lovingly with all our animals and all animals loved her very much! So we have to say: Thank you Haruka! We wish you a nice time in Germany until you back to Japan in August and we wish you a happy future :-)! Das war meine Erste Workaway. Ich habe drei Wochen bei Thomas und Heike geblieben. Das war sehr schöne Zeit und drei Wochen waren sehr kurz Zeit für mich.
Thomas und Heike sind sehr freundlich und sehr nett für mich.
Ich habe viele Dingen von Thomas und Heike gelernt, nicht nur Deutsch und Aussprache, sondern auch Tiere und… read more Kultur in Deutschland. Manchmal war es schwierig für mich, dass Japanische Kultur auf Deutsch erklärend habe, aber das war sehr wichtige Erfahrungen für mich. Und das macht mir viele froh, ihr haben viele Interesse meine Japanischen Kultur und wir haben zusammen Japanisches Essen gehabt und Heike hat Stäbchen gekaut! Jeden Morgen und jeden Abend geben wir Hutter für Lama, Alpakas, und Pony und Ziegen. Das war sehr lustige Zeit für mich. Und habe ich immer mit den Hunde und Katzen gespielt. Alle Tiere sind auch freundlich. (besonders Hunde und Katze :-) ) Ich vermisse immer euch. Und Thomas hat mich das Rezepte von Apfel und Nutella Kuchen gelehrt und wir haben oft zusammen Kuchen gebacken. ( nicht nur Deutsch Kuchen, sondern auch Japanisch Matcha Kuchen! ) Und haben wir jeden Montag und Donnerstag mit Kristian Karte Game gespielt! Das war auch schöne und lustige Zeit für mich.
Jede Abend ich habe Deutsches Essen gehabt und alles waren wirklich lecker! This was my first workaway experience. I stayed three weeks by Thomas and Heike. I think it was too short time to spend with them. I have often german und japanese cake with Thomas baked. Und every evening Heike cooked delicious german dishes. All dishes were very delicious and I learned many German Foods! Every evening (after dinner) we watched movies and Tartort!! It was also wonderful time for me. Im very happy, because they have many interests for my jananese culture. Sometimes It was very difficult to explain my cultur in German, but it became good experience for me. I think my German skill got better than it was thanks to Thomas and Heike. It was my first experience Workaway and it was a really Nice one. Thomas and Heike are really kind and they made me feel home! I really enjoyed to be with the animals, to clean the stables, to scratch the cats and the dogs! I miss them!!! I highly recommend to stay at their place if you like animals, nature and the beautiful landscape of the… read more North sea. I would have love to stay longer, I thank you both and wish you thé Best! I spent 2 months and a half with Heike and Thomas and it was a wonderful time! It was my first Workaway experience, everything was great and I will never forget it! It was like being part of the family and it was very nice to share time and moments together. My level in German was not very good and I made a lot of progress by discussing and… read more laughing with them. Taking care of the animal was a pleasure, they are very lovely and always do funny things. It will be very difficult for me to live without animals for a while, I was so used to the dogs greeting me in the morning, the cats on my legs in the evening, and petting the lamas and alpacas when I was in the stable! It was really relaxing to be in a peaceful place, without auto or city sounds. As the others workawayers have said, Thomas and Heike are fantastic hosts, they are very kind and careful with workawayers. It is really hard to say how much I am grateful to them for their welcoming. Even if I knew that I will have other experience in the near future, I was very sad to leave them. You just feel good when you are with them and work with the animals. All I can say to people who search a nice place to stay is “ go to Heike and Thomas farm, you won’t regret it!”. Thank you so much Thomas and Heike for all you did, I hope that I will come back soon! Marie spent two and half month with us on our farm and very fast she became a part of our family :-). Marie is a very, very polite and friendly young woman. She loves animals and all our animals loved her! In the stable she was absolutely diligent and reliable. Two times we had to leave the farm for a whole day and we knew: Marie will supply… read more all the animals totaly correct. Marie spared no work, she always offered her help. She is a great cook of Breton specialties and we enjoyed her Crepes and „Gateau Breton“ very often. Marie will be in Berlin from January for six months and we wish her good luck for all she wants to do there. We have invited her to visit us whenever she wants. Whenever Marie will ask you if she can spent some time with your family say „ Yes!!“. You will not regret! Marie is a great asset for any family and we will certainly often remind us of the beautiful weeks with her. Thank you Marie, it was really great to have you here with us! Cornelia spent a month on our farm. She had never lived with animals, but very quickly they learned all about the care and handling of the different types. She was a great help in the barn and in the household always very diligent,too. Cornelia was always on time, even early in the morning :-)! She was always cheerful and friendly and.... she… read more cooks fantastic meatballs! Thank you T & H for a wonderful experience. In the four weeks I stayed at your farm I learned so much, not only about taking care of and living with animals but also quite a bit of useful general knowledge as well as what being a responsible consumer means. You always made sure of my well-being and provided me with… read more delicious food. I want to thank you especially for all the card games we played in the evenings. THANK YOU T & H.
Staying at this farm for four weeks was an excellent choice. You have your own bedroom as part of an apartment with your own bathroom and a living area you can use (well you have to share the latter with two cats ;D). The work is mostly related to the animals including helping out with the morning and evening feeding. I enjoyed my work and loved experiencing how it is to develop relationships to the animals. T & H are really accommodating and try their best to make sure you are feeling well. They also lend you a bike to explore the area. If you like it quiet and more lonesome this is a perfect opportunity to explore a bit of northern Germany. In case you have any more questions or are in need of more detailed information/feedback please do not hesitate to contact me. (I speak English and German). Ilaria spent one month with us on our llama farm. Very quickly she got used to us and we got used to her! Ilaria spared no work, she always offered her help. She is a great cook of Italian pasta and Polenta, we learned a lot from her and we will certainly often use their recipes! Ilaria studies philosophy and she will be in Gießen from September for six months to graduate a semester abroad. We have invited her to visit us whenever she wants. Thank you Ila, it was really great to have you here with us!!! I spent a month with Thomas und Heike and my experience was really great. It is surrounded by beautiful fields and cycle phats that allow you to explore the whole North sea cost ( they will give you a bike, a map and all the necessary tips you could need). If you are looking for nature and calmness far away from the city this place with his… read more beautiful colours and landscapes is perfect for you. Here life goes slowly and quiet and even the work in the stable is enjoyable. I would describe it more as a likeable activity than as a work. You'll feed their lovely animals and you'll have a lot of new furry friends. And now, last but not least, what can i say about this family? Thomas and Heike are kind and careful with the workawayers. I will never forget all the lovely moments we spent together, playing cards, shearing the lamas (with El Nino not so lovely but of course funny ) or eating a Fishfridakellenbrötchen while watching the sunset on the North sea. They were kind with me and i really felt part of this family. 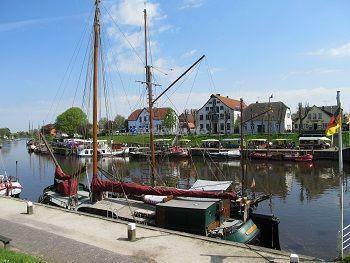 During the weekends we had the opportunity to visit some villages together enjoying Straßenfest or Kutter Regatta. Höke family, thank you again for this tolle tolle experience :). Thank you Valentine and we wish you all the best for the future in Luxembourg City and Saarbrücken! I learnt many words and I think I could really improve my german ! Then the place where Heike and Thomas live is very well and calm. The landscape is beautiful and if you want, you can ride with bike to see. After a month with Thomas and Heike, I can easily confirm the previous feedbacks and say that they are both FANTASTIC HOSTS. If you love nature and animals, this is the perfect place for you. The farm is really peaceful and well located : you can use one of their bikes and explore the surroundings, the cycle paths are very nice. 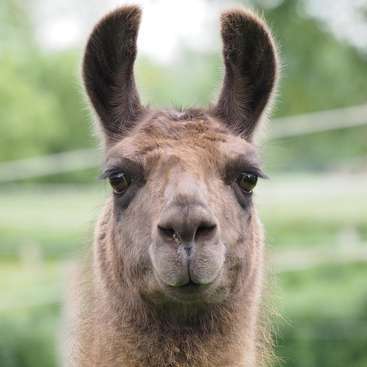 At the farm,… read more you will have the occasion to work with lamas and alpacas, which are amazing creatures. I've loved to train with them and learn more about their behaviour and habits. I will miss all of them, especially "Falco", the clown !! On the evening, you will often share good meals and then play cards while eating chocolates. They have an awesome terrace with deck chairs and of course, a nice barbecue that we've enjoyed many times. My german was really terrible when I arrived and thanks to Thomas and Heike, I've really made progress. Many thanks to you two for your generosity and your kindness, I've had an incredible experience here. Cristina stayed a month with us at the llama farm, and it was a truly nice time! She quickly became part of the family and we enjoyed our free time together. 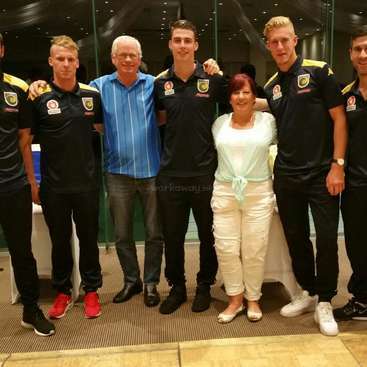 Thomas and I learnt a lot about Mexico and had a good opportunity to improve our English! If Cristina asks if you can host her, say yes! Don't miss this opportunity. Then, you must ask her to prepare you her pizza. We would have hosted her longer, but sadly, had to go back to Houston to continue her studies. If she ever wants to visit us again, she is happily welcome! This was my first work-away experience and it went above and beyond my expectations. I stayed with Heike and Thomas for a month, and they were really the best hosts ever. They make you feel part of their family, are always laughing and are so sweet to their Workawayers. You can also tell that Heike and Thomas love their animals, and they take… read more such good care of them. The work they do is very interesting, and you'll find that you learn a lot just from talking to them. Feeding the llamas, ponies and goats was so much fun. After a few days, the llamas start recognizing you and following you because they know you have their food. Helping Thomas in the stable never felt like work, but instead was a fun activity I looked forward to. Dinner was always a great part of the day, sitting together, playing card games and eating lots and lots of chocolate. Thomas and Heike were super nice at accommodating my food restrictions and ate what I cooked even if sometimes it was a little spicy. The area is also beautiful. Sadly, I left just as it was getting warm outside, but the beach is an easy bike ride away and very cute towns are also within biking distance. When it was sunny, I loved to go outside and take pictures of the animals or ride the bike to the beach and read. Overall, it was a really, really great experience. I'm very sad to leave, but happy that I had the chance to meet them and hope that in the future I can return! thank you very much for your feedback :-). I wish both of you a lot of Workaway guests to help renovating the stable, and perhaps we will see us again in the summer! 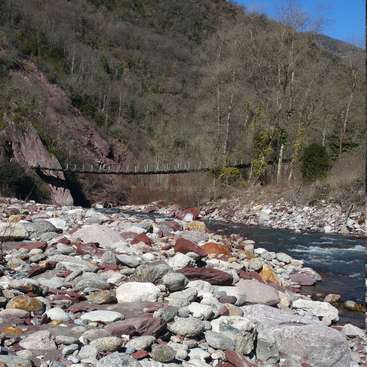 Permaculture garden, food forest and yoga centre near Nice, at the foot of the French Alps!